Over the near-term, since mid-February of 2011, the S&P 500 has been going nowhere, stuck in a multi-month horizontal range that is bound between a floor at 1249, and a ceiling at 1370. Following a rapid move back up toward the upper end of its range after testing its base in mid-June, S&P 500 bulls are expressing some reservations. 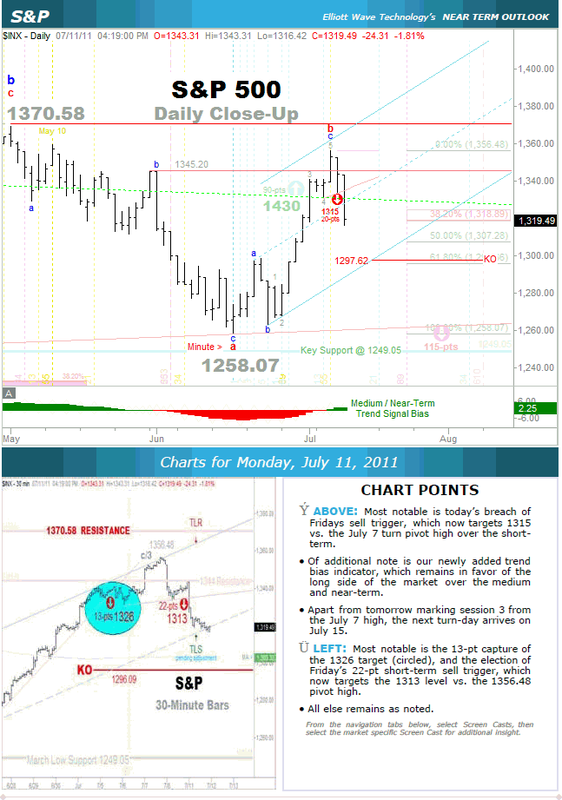 Short-term, we have circled capture of an old 13-point downside target of 1326 from early July, and draw your attention to a sell side setup mapped out last Friday, which currently cites a short-term downside target at 1313. Our recent work in the US Dollar conveyed that the US currency was coiling and set to unwind . Well, unwind it did, at least over the short-term. Trading with a respectable level of inversion to broad equities the recent upside move in the dollar added confidence to our outlook for the imminent weakness we are now experiencing in the S&P 500. Select the 480p setting after starting the player for the ^ best quality viewing. I trust and hope that you have extracted something of actionable value from this edition of Technically Speaking. Elliott Wave Technology's Near Term Outlook is for those who demand masterfully consistent and objective technical analysis that visually lays out actionable ideas from which to engage the broad markets over the short and near term. The publication is delivered to institutional and private clients each Monday, Wednesday, and Friday evening. The Near Term Outlook covers 7 essential broad markets.